Tennis Channel is your home for Tennis. 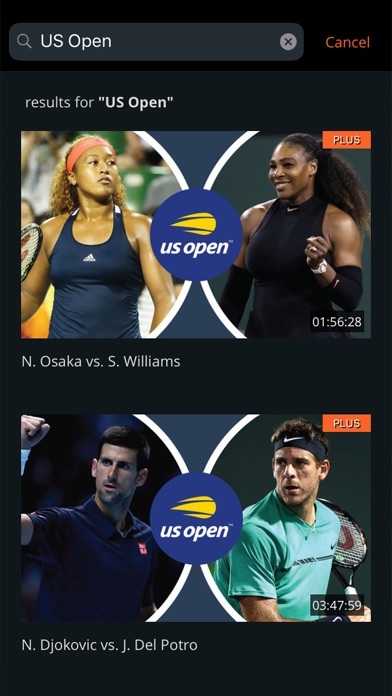 Subscribe to Tennis Channel Plus and watch over 1300 live matches as well thousands of on-demand matches. Are you a Tennis Channel subscriber? Authenticate and watch the network streamed live. 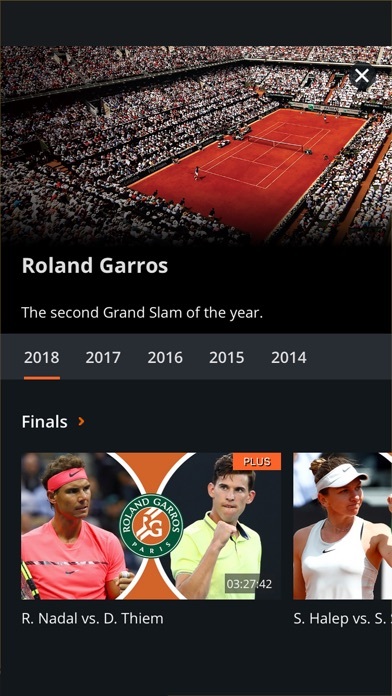 Tennis Channel Plus subscribers will unlock access to over 650 live matches not available on Tennis Channel including the French Open mosaic, ATP and WTA tours, Davis Cup matches, Fed Cup matches, plus thousands of hours of on-demand programming. Access to Tennis Channel Plus requires a subscription. -An annual subscription is valid for 1 year from date of purchase. -Payment will be charged to your iTunes Account at confirmation of purchase. -Subscription automatically renews unless auto-renew is turned off at least 24-hours before the end of your annual subscription, by going to the Account Settings after purchase. -Your account will be charged for renewal within 24-hours prior to the end of your subscription and will renew for an additional year for all annual subscriptions. -No cancellation of the current subscription is allowed during the active subscription period. 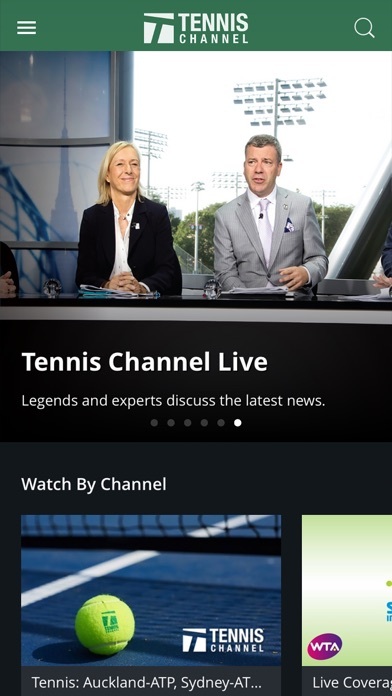 Access to live streaming of Tennis Channel is determined by your TV provider. The following providers offer access to Tennis Channel live streaming: -AT&T U-verse -Cox -DISH -DirecTV -Verizon FiOS -Frontier -Select NCTC partners Please check back regularly as new TV providers are added. 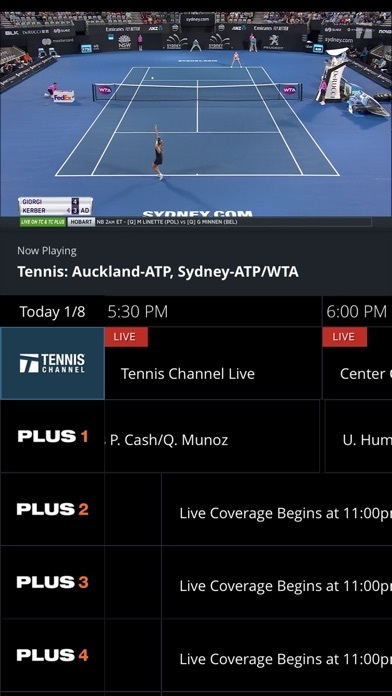 No live games for $100 a year unless you also subscribe to the Tennis Channel with your provider, what a ripoff. If you make mistake there is no refund after 24 hours. Can’t sign in on my iPad. Can’t sign in on my iPad. I have logged in successfully on my iPhone but can’t watch on the larger screen. I have signed in at the settings window but then get asked to sign in to watch live tennis. When I touch the second sign in window the wheel just spins and stops. Nothing happens. No way to do anything once that happens. I’ve reloaded, restarted and it continues to happen every time. This is really frustrating. Tennis channel plus, what a joke!!!!! You need to fix this now!!!!!!!!!!! you keep treating tennis fans like this and soon it will be on the 6pm news! Surprised that Xfinity/Comcast does not provide streaming access. Major cable company is very disappointing. I was able to log in after several tries, but I am frustrated by the site and its programming. I get that Tennis Channel has a deal with the WTA to show WTA matches, but what about ATP matches? Also, the sound does not always match the video which is useless. Finally, I have Comcast, and TC will not let me watch their live programming—Comcast is not on their list of providers. I too pay close to $100 a year for what is, at best, a mediocre delivery system. Get yourself some UDX people to help fix this poorly designed and poorly delivered app. I know there is a lot of competition, but given its price TC Plus is on the worst 10 list. Even though I have shelled out $100, it demands that I sign in with my cable provider, which is not on the list. Even if I could get in, the listings of what is on are all wrong. DON’T GET SUCKERED IN! Cannot watch on my fire stick. Every time I click on it, I am prompted to sign on AGAIN. It is terrible and not worth the money. I was able to watch one match. Tennis Channel should be embarrassed to put such a product out there with their name on it. Just like the other reviews: I can’t sign in! I thought with the “new bug fixes” that this would be solved, but no matter what I do (reinstall, reset my password, etc) I still can’t sign in! They took my $100 without any recourse to getting it back other than an appeal! Even when I’m logged in, which for some reason doesn’t work sometimes, I can still often not access the Plus content. Absolute garbage. I’m attempting to watch the live stream, but when it tells me to sign into my tv provider, i do, and it never goes away and still says i need to sign in. I’m not even trying to watch tc plus. Just the live channel. And it won’t let my by the “HEY TENNIS FANS” promo video.